On first inspection of Roddy and Leyre’s idyllic little country pad outside Geneva you’d be forgiven for thinking they’ve settled for a more relaxed version of the good life since leaving bonnie Maryhill behind. The chickens roam about the beautiful garden and the vegetable patches and planters are primed for a spring of planting and a summer of free-range home-produce indulgence. The generously apportioned shed next to the house hints, however, at a slightly faster pace of life. Bikes and skis of all shapes and sizes, an envious technical jacket rail, ropes hang neatly coiled on hooks, bags for any a dventure sit ready for action. I love a good shed, this is a great one. It is when you then realize that Leyre is in charge of the world changing, multi-national project CERN and Roddy is an international construction man of mystery that it quickly becomes apparent there ain’t a lot of spare time! We understand this. Kerry and I don’t exactly spend many evenings with the feet up watching X-factor. Therefore it was a minor miracle that we managed to pin this weekend into the diary a few months ago. After a few weeks of pretty dire winter conditions on all but the highest slopes the Alps got a decent dump right before we arrived. Fantastic. Nailed it. The great thing about staying with the locals is flexibility. Arriving on Thursday night we checked the forecasts and decided the best shout for the following day was to drive into Switzerland and around the North side of the lake, to a small local station called Leysin. Unfortunately Leyre had to work Friday but Kerry, Roddy and I headed away, keen to get some turns in. The clouds that had brought the prized snow were still hanging around so there was little vis however the snow was pretty good and we spent a very enjoyable day on the long top to bottom runs with hardly another soul in sight. Our plan for Saturday was for a good big day and that’s exactly how it worked out. 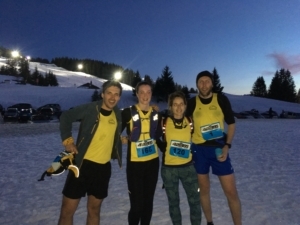 From deciding on this weekend the Alpine Division put their local knowledge to good use and found an evening hill race which we could tackle: The Trail de l’Aigle Blanc. The race was at the Col de la Croix Fry near La Clusaz and started at 6pm. Perfect. 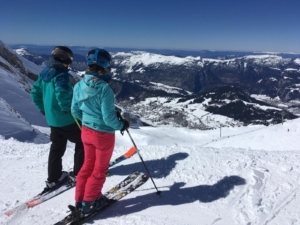 A leisurely start to the morning gave way to some great skiing into mid-afternoon on Le Massif de Balme which was perhaps not ideal warm up but when in Rome and all that. We then headed along to the race registration where a slight forename/surname mix-up meant I was given bib number 1 – an excellent omen. The course is a 10ish km with 275ish m ascent, fast-ish xc style blast round a lumpy xc skiing loop. Think a Trossachs trail race on groomed slopes. In typical European style there was an abundance of arm warmers and shights. Lots of fancy gear and I expected a fair bit of idea. We made sure we were properly represented in our manky yellow vests. With heavy legs from the earlier skiing we set off at a good pace. Roddy and I made sure to get near the front. Game plan being hang on as best we could to the top of the hill then cause damage on the down, capitalising on the inevitable weakness of the lycra clad European – their crap descending. But of course this was not a hill race, but the most knackering of categories, the all-too-runable trail race. The saving grace was the snow which was as unpredictable in its underfoot support as the green bog of Cort ma Law. This definitely helped hold the fast runners back a bit and allow us to tramp our way along with only some minor swearing. I can tell Roddy’s still not found a suitable equivalent to Monday reps as I managed to pull away from him after a few km’s and although I kept checking my back managed to hold him off to the finish. The sunset views on the massive snowy, cliffy mountains around us were fantastic – a pure magic red glow. I had a good mental battle with the guys both in front and behind me for the last 5km but all we could manage was to hold our positions with a decent pace. We set no records. We all got finished and changed just in time to catch the second half of the rugby in the little pub at the bottom of the piste. Don’t think they quite knew what to make of us but it was impossible to sit still. Then we got our post-race stew and smelly cheese and were on our way back to Geneva HQ. Sunday morning we had a relaxed stroll around a lovely wee village with a great street market. We ate some good food and drank some nice coffee then it was to the airport and back home. Easy as that. Another quality weekend with the Alpine Division and we are grateful for their fantastic hospitality and encourage others to milk the fact that there’s a sofa bed in the Alps! Looking forward to our next adventure. Brilliant stuff – good to see some international athletics!